When I first started teaching French, I certainly could not have envisioned that all my classes would be held online, that my students might be in Hong Kong, deployed in Afghanistan, or figure-skating outside of Paris — all actively pursuing their Associate degrees from Northern Virginia Community College. But this is the case. What my students have in common are their computers and tablets, microphones and mobile devices. Our landscape is radically different because we have Skype, our Learning Management System (LMS) with its discussion board and external links, and more recently, a free and open communication tool called Google Hangout! Now we can chat and share screens and assignments in real time or later on. For reference material, we start with Google and all kinds of Wikimedia, in addition to our college library website. This is the open world I always hoped for — to bring education to the many and to make a dent in the divide between the “haves” and the “have nots.” And never in this world has it been more necessary. Since 2000, I have been an editor of the Multimedia Educational Resource for Learning and Online Teaching (MERLOT). A pioneer in the Open Educational Resource (OER) movement, MERLOT constitutes a one-stop site for educators who need to design a robust learning environment for their students. To access the following sites, click on the links or go to www.merlot.org and enter the boldfaced titles in the search field. Francais interactif: When my students need a concise example of language in context, Tex’s French Grammar, just one component of Francais Interactif, provides brief and humorous dialogues to illustrate structure points, bref. Complements what students learn in my course. Includes an excellently moderated Facebook page which my students visit for extra credit. Students from around the globe interact and share great video and music. LangMedia Foreign Language Media Archive: Direct access to culture and language through short student-produced videos with target language transcripts, realia, and language by country index. Editor’s Choice Winner! COERLL: Interactive multimedia learning materials in a variety of languages including LCTLS, many with five-star peer reviews in MERLOT. User-friendly and impeccably designed. REALIA Project: Language faculty provide target language realia online for educational use by instructors and students. Every picture tells a story leading to target language instruction. Today’s Front Pages: Target language newspapers with a pdf to the front page and links to the online version. Great for all levels and languages. Lexiquefle: Quick and easy target language vocabulary modules from Thierry Perrot. Online students get to hear a different accent than mine! Forvo: The largest pronunciation guide in the world. Users verify the pronunciation of words they are learning. BonPatron: A grammar corrector that finds spelling errors and grammar mistakes in French. ISL Collective Fiches FLE Gratuites: Quick access to French worksheets for students who like to learn that way. French Listening Resources: From Jennie Wagner, because you cannot get enough listening texts when you study online. What kinds of resources do you think are essential to making your online class a more complete learning environment for your students? I’d love to hear your thoughts. 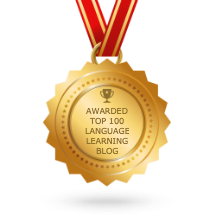 To read more about teaching languages using free OER, see Why I Love and Hate My Spanish MOOC by Fernando Rubio. Next Post >>Got Textbooks? From This Century? Thanks for mentioning BonPatron.com. Thought we’d mention that we also have a similar tool for Spanish: spanishchecker.com. Thanks, Laura. I love it when people share their favorite resources. And thanks for the COERLL shout out. Keep up the good work at MERLOT! We really appreciate COERLL’s high quality in all the different languages. I am currently looking at Clica Brasil Thanks for all that you do in the field of OER. Laura, as always, I look to you for great, leading edge ‘teachnologies’ for world languages. MERLOT is incredible: I hope more of use will review online materials to spread the wealth and use the strength that is peer review (for both users and for producers). You are so right about the need for more peer review. MERLOT’s peer review standards are Quality of Content. Potential Effectiveness for Teaching and Learning and Ease of Use. World Language educators who are interested in peer review receive free training and work on reviews with our experienced editorial board members, educators like you who are aware of what constitutes high quality in online resources. Thanks, Laura, for sharing these tools. Would you mind posting a sample week of lessons? I’m interested in seeing how you weave all of these resources into your curriculum via discussion boards and chats. If you can imagine your typical LMS, the MERLOT suggested materials get weaved into the Web Links section, where students have access to annotated links organized by chapter. So, there is a folder entitled Reference Tools for All Lessons that has links to a grammar guide, a good online dictionary and links to external websites that students can consult in doing their communicative tasks. I then correlate the sites to my unit goals as far as vocabulary, culture, literature and structure are concerned. I also encourage students to build their own MERLOT personal collections to support their work in my course. They often come up with great suggestions. This week, we have just discovered the Prononciateur from Bonjour de France which uses speech recognition at a variety of levels. Great material! Thanks, that’s what I imagined. Do you use a regular textbook or do you create your own from all OER? Thank you for this comprehensive list! There are some websites on here I haven’t used before that I will definitely need to check out, especially the pronunciation and audio sites, and I will always love Tex’s French grammar site. One that I like that’s not on your list is linguee.fr. I found it about six months ago and love it for showing any phrase I’ve ever searched for, in English or in French, with multiple examples of the phrase in context with direct translations. I’m bookmarking your page so I can come back and make sure I try every site on the list :). Thanks Brittany, we’re glad you’re using the list! And thank you for sharing linguee, I’ve also found that to be a useful tool, especially since the translations there are done by real people and not machines.